The normal process of parturition relies in part, on the physical relationships between the fetus and maternal bony outlet. In addition, fetal posture, placental and cord locations, as well as maternal soft tissues also are factors in the efficiency and safety of the birth process. This chapter discusses how to define, diagnose, and manage the clinical impact of abnormalities of fetal lie and malpresentation. The most common clinical correlation of the abnormal fetal lies and presentations is the breech-presenting fetus. In describing fetopelvic relationships, the clinician should carefully adhere to standard obstetrical nomenclature. Fetal lie refers to the relationship between the long axis of the fetus with respect to the long axis of the mother. The possibilities include a longitudinal lie, a transverse lie, and, on occasion, an oblique lie. Fetal presentation is a reference to the part of the fetus that is overlying the maternal pelvic inlet. The most common relationship between fetus and mother is the longitudinal lie, cephalic presentation. A breech fetus also is a longitudinal lie, with the fetal buttocks as the presenting part. Breech fetuses also are referred to as malpresentations because of the many problems associated with them. Fetuses that are in a transverse lie may present the fetal back (or shoulders, as in the acromial presentation), small parts (arms and legs), or the umbilical cord (as in a funic presentation) to the pelvic inlet. In an oblique lie, the fetal long axis is at an angle to the bony inlet, and no palpable fetal part generally is presenting. This lie usually is transitory and occurs during fetal conversion between other lies. The most dependent portion of the presenting part is known as the point of direction. The occiput is the point of direction of a well-flexed fetus in cephalic presentation. The fetal position refers to the location of the point of direction with reference to the four quadrants of the maternal outlet as viewed by the examiner. Thus, position may be right or left as well as anterior or posterior. Fetal attitude refers to the posture of a fetus during labor. Mammalian fetuses have a tendency to assume a fully flexed posture during development and during parturition. Flexion of the fetal head on the chest allows for the delivery of the head by its smallest bony diameter. A loss of this flexed posture presents a progressively larger fetal head to the bony pelvis for labor and delivery (Fig. 1). The fetal arms and legs also tend to assume a fully flexed posture. The longitudinal posture of the fetus likewise is flexed under normal circumstances. The mechanism of labor and delivery, as well as its inherent safety and efficacy, is determined by the specifics of the fetopelvic relationship at the onset of labor. Further correlations with fetopelvic relationships are important before birth. The relative incidence of differing fetopelvic relations varies with diagnostic and clinical approaches to care. Among longitudinal lies, about 1 in 25 fetuses are not cephalic but breech at the onset of labor.1 Of the differing lies a fetus may assume, about 1 in 100 is transverse or oblique, also referred to as nonaxial. As pregnancy proceeds to term, most fetuses assume a longitudinal lie with relationship with the maternal outlet. Conversely, when labor and delivery are considered to be remote from term, the proportion of fetuses in abnormal and suboptimal locations increases (Table 1). Transverse and oblique lies also are seen with greater frequency earlier in gestation. A fetus in a transverse lie may present the shoulder or acromion as a point of reference to the examiner. As term approaches, spontaneous conversion to a longitudinal lie is the norm. As seen with breech presentation, there is a rapid decrease in nonaxial lie during the third trimester. With the comprehensive application of ultrasound in the antepartum period, discovery of a transverse or oblique lie has increased. However, nonaxial fetal lies usually are transitory. Congenital anomalies of the fetus also are seen in association with abnormalities in either presentation or lie.3 Whether a cause (as in fitting the uterine cavity optimally) or effect (the fetus with a neuromuscular condition that prevents the normal turning mechanism), the finding of an abnormal lie or malpresentation requires a thorough search for fetal maldevelopment. Abnormalities seen include chromosomal (autosomal trisomy) and structural abnormalities (hydrocephalus), as well as syndromes of multiple effects (fetal alcohol syndrome) (Table 2). CNS, central nervous system; GU, genitourinal. Congenital anomalies of major structures are seen in 3–5% of all births. The incidence in breech delivery is three times greater when controlled for gestational age. Among premature breech infants, the incidence is even greater, as it is for all fetuses born prematurely. Prematurity is a crucial factor in the incidence as well as the clinical implications of abnormal fetal lie and malpresentation. Fetal size and shape undergo dramatic change during the second and third trimester (Fig. 2, Table 3). Because the fetus has a relatively larger head than body during most of the late second and early third trimester, the fetus tends to spend much of its time in breech presentation or in a nonaxial lie as it rotates back and forth between cephalic and breech presentations. The relatively large volume of amniotic fluid present facilitates these dynamics. Breech presentation is more common at earlier gestation and therefore is seen more frequently among low-birth weight infants4 (Table 4). Breech infants are more likely to be small for gestational age regardless of their gestation at delivery. The small size of the premature fetus is further compromised by the specific malpresentations that occur. With less neurologic and muscular control, deflexed or even extended varieties of fetal presentations are seen. Most common are the “incomplete” types of breech presentation, such as footling breech presentations (Fig. 3, Tables 5 and 6). Deflexion of the fetal head, more commonly seen in preterm fetuses, results in the potential for further compromise at delivery. Thus, the problems associated with abnormal lie and malpresentation are most frequent and of greatest consequence in preterm labor and delivery. At term, similar, though usually less dramatic, consequences may be seen with fetuses who are in abnormal positions. Perinatal morbidity and mortality is threefold higher in breech presentation than cephalic presentation. Much of this excessive compromise is caused by factors that are not directly preventable. According to Kaupilla,5 64% of deaths among term breech infants resulted from congenital malformations or infection. In a different population, Todd and Steer6 found that 23 of 34 term breech deaths among 1006 term infants were not related to complications of breech delivery but were associated with anomalies, infection, and isoimmunization. As noted earlier, preterm and small-for-gestational age infants commonly are associated with breech labor and delivery. As for term breech infants, experience indicates that most of the adverse outcomes seen are unrelated to breech delivery. Thus, for all breech fetuses, about one third of the excessive perinatal loss falls to birth trauma and asphyxia. The complications associated with abnormal fetal lie and malpresentations include both maternal and fetal. As noted earlier, prematurity and malpresentation are strongly related. Circumstances in which premature birth may occur also include maternal complications such as pregnancy-induced hypertension and medical complications (cardiovascular, neoplastic), as well as obstetric problems such as premature rupture of membranes and chorioamnionitis. The circumstances dictating delivery may further compromise the preterm fetus. The obstetric complications for the fetus include a diverse group of misadventures. Prolapse of the umbilical cord, intrauterine infection, maldevelopment as a result of oligohydramnios, asphyxia, and birth trauma all are concerns. The fetus in the transverse lie, regardless of gestational age, generally requires cesarean delivery. At cesarean section, delivery may be aided by converting the fetus to a longitudinal lie for the delivery after entering the abdomen. This conversion may allow for the use of a transverse incision into the uterus instead of the more morbid vertical incision. External cephalic version (ECV) should be considered in a nonlaboring patient. When the diagnosis is first made at term, spontaneous conversion to a longitudinal lie is less common than for its breech counterpart. This results from the higher incidence of structural causes for the transverse lie. When abnormal presentation or lie occurs in a twin gestation, management includes a greater range of options. The conversion of a backup transverse second twin, either by internal or external version at the time of delivery, is an option for the experienced clinician. When the back is down at the time of delivery, the prudent course for the delivery of a fetus in transverse lie is by cesarean section. Strong consideration should be given to the incisions at delivery in this circumstance, with a vertical uterine incision being used liberally. When a fetus in a transverse lie is diagnosed remote from delivery, as occurs at time of ultrasound, the physician is faced with an additional dilemma. Spontaneous rupture of membranes may result in cord prolapse or compromise with the risk of fetal asphyxia. Delivery at the time of antepartum ultrasound before term may result in jeopardy because of prematurity. External version, as a correction, may be attempted as long as ultrasound excludes placenta previa and documents an appropriate amount of amniotic fluid. Experience has demonstrated some success, although in general, the use of ECV is more likely to be successful for a breech-presenting fetus. The patient should be carefully counseled about the problem and its inherent risks. Hospitalization and observation may be considered. However, the cost–benefit ratio in this era of managed care makes prolonged hospitalization unlikely under most circumstances. I recommend twice-weekly fetal surveillance to assess for cord compromise. The patient should be warned about the signs and symptoms of preterm labor and encouraged to present to labor and delivery should these conditions arise. Under certain circumstances, home uterine activity monitoring may provide a useful adjunct. The antepartum diagnosis of persistent breech presentation is accompanied by similar concerns. In addition, careful evaluation for fetal anomalies is warranted. A targeted ultrasound by an experienced ultrasonographer is useful to diagnosis structural fetal defects and to ascertain appropriate fetal growth. Prenatal diagnosis by maternal screening or amniocentesis may be indicated. When premature rupture of membranes occurs, consideration of a timely delivery should ensue. Depending on gestational age, amniotic fluid volume, and cervical evaluation, a limited course of tocolysis, antibiotics, and steroid administration may be indicated. When a fetus with an abnormal lie or malpresentation presents under these circumstances, hospital care is best managed within the confines of labor and delivery, where fetal surveillance can be maintained on a continual basis. This is indicated primarily because of the risk of cord prolapse or compromise. With severe oligohydramnios, the high incidence of intrauterine infection adds measurably to the risks of maintaining the fetus in utero, and an expedited delivery is warranted routinely. As previously discussed, the new intrapartum diagnosis of a transverse lie generally results in an expedited cesarean delivery. When a transverse lie is associated with prolapse of the umbilical cord, a true obstetric emergency may arise. Pelvic examination, with relief of pressure against the umbilical cord, should be performed and parenteral tocolysis administered if contraindications are not present. Changes in maternal positioning, particularly the lateral supine position, usually are well tolerated by both patient and practitioner. Transport to a delivery room equipped for cesarean delivery should be accomplished promptly. When setup is complete, abdominal delivery is performed. A consideration for a limited attempt at version may play a role in this clinical scenario after anesthesia has been satisfactorily obtained. After a diagnosis is confirmed, the patient deserves as thorough an explanation as is called for by the specific situation. She likely has heard, at least peripherally, that a breech baby means a mandatory cesarean section. Whereas there is some truth in this simple association, I strongly believe that as the patient's advocate, physicians undertake the responsibility to provide a fuller discussion. Most breech fetuses at term are not a complex problem. Most do not have congenital anomalies or other adverse obstetric problems. Their potential problem centers on the risks of asphyxia and trauma during labor and delivery. Clearly, this group of risks, however clinicians clinically work to minimize them, are best avoided if possible. Therefore, the diagnosis of breech presentation before labor allows the patient to undergo ECV and hopefully delivery as a cephalic fetus (Fig. 4). ECV is a time-honored approach to correct a “malpresentation.” It was used in the past as soon as the diagnosis of a breech fetus was made. This led to many second-trimester and early third-trimester procedures. Given the size of the fetus and the quantity of amniotic fluid present, it is not surprising that the failure rate was high. Because most of these fetuses would have spontaneously converted to cephalic presentations at the time of labor, using ECV resulted in many unnecessary procedures12 (Table 7). In fact, the earlier practitioners of the 20th century used sufficient force to avoid the need for a cesarean section under these circumstances that general anesthesia was used, as well as regional anesthesia and analgesics. Unfortunately, the great forces were associated with serious trauma to the placenta and uterus. Spontaneous rupture of both the uterus and the membranes, placental abruption, and fetal isoimmunization also were seen and resulted in the abandonment of this approach. If ECV fails or if the patient finds it unacceptable, at least two further choices remain. The first is delivery by cesarean section. If the patient is a candidate, the second is a selective trial of labor. Once the diagnosis of breech presentation has been confirmed and attempts at ECV have failed, both patient and physician require a heightened effort at communication to ensure that a plan of care is established that is mutually acceptable. Potential risks for the breech fetus approaching term include umbilical cord prolapse, prolapse of the fetus before complete cervical dilation is achieved, and a rapidly progressive labor, with delivery imminent on arrival or even en route to labor and delivery. Prolapse of the umbilical cord is an unusual complication in a term fetus in the early stages of labor. Because a breech fetus presents a smaller and less complete covering to the pelvic inlet, this risk is greater for all breech fetuses in comparison with all cephalic fetuses. Among breech fetus, the less complete the flexion of the lower extremities—such as occurs in footling breech presentations—the greater the risk. Other factors, however, play a role in mitigating or increasing this risk. The nonasphyxiated fetus generally possesses a turgid umbilical cord, coated in Wharton jelly. With normal blood flow, cord prolapse is unlikely, regardless of position. Prolapse of the cord also is decidedly more common in the second stage of labor, when maternal expulsive efforts result in expression of the uterine contents (Table 8). The exception occurs when the cord is located as the most dependent fetal part at the onset of labor, as seen in funic presentations. Ultrasound examination, in conjunction with color Doppler scan, can help to locate the exact position of the umbilical cord and should be performed at the time of ECV. Cesarean delivery has been liberally used to decrease perinatal mortality and morbidity for the breech fetus. The potential to avoid birth trauma and asphyxia led to its application to a greater extent even in the early part of the 20th century, when the safety of cesarean delivery was in greater question. As its use increased, the perinatal mortality associated with a live, nonanomalous fetus at term dropped dramatically26 (Fig. 5). Wright, in 1959,27 called for the exclusive use of cesarean delivery for breech fetuses. In this and earlier eras, prematurity, low birth weight, or congenital anomalies went untreated or undertreated, and so the only group of breech fetuses that had a chance for survival were those infants born of normal weight at term. With the avoidance of intrapartum asphyxia or birth trauma sustained during delivery, the outcome could be improved. Indeed, a great difference in outcome was attributed by some to the risks of labor and delivery28 (Table 9). Although the liberal use of cesarean delivery is indicated for breech fetuses, there is concern about whether its routine use is warranted. In a study by Green and coworkers,29 the rate of cesarean delivery for breech increased from 22% to 94% on the same medical service over a 15-year interval. Despite this extensive application of cesarean delivery, the perinatal outcome, as measured by evidence of asphyxia, trauma, or intrapartum death, was unchanged (Table 10). Cesarean delivery increases maternal morbidity and mortality, albeit to a lesser extent than in the past. The relative risks and benefits to both mother and infant should be presented by the physician to the patient (Table 11). The cost, both economic and psychological, of cesarean delivery also has been debated. In past eras, a greater dollar cost was associated with abdominal delivery. With shorter stays and improved approaches to cesarean delivery, the difference has narrowed. C/hysterectomy, cesarean delivery and hysterectomy; C/D, cesarean delivery; NS, not significant. Another approach is the selective use of a trial of labor. By identifying which breech fetuses and mothers have the greatest predictable risk, cesarean delivery can be used for the group likely to have the greatest gain. By avoiding cesarean delivery in the low-risk pairings, use of cesarean delivery can be minimized, with subsequent savings to the health system of limited resources. Many authors realize the potential benefits of such an approach.30, 31, 32 At a 4% incidence and at 4 million births a year, some 160,000 pregnancies are complicated by a breech-presenting fetus at term on an annual basis. At a rate of cesarean delivery of about 90%, this results in 144,000 procedures, almost one-fifth that of cesarean delivery. By selecting a low-risk group for a trial of labor, the overall use of cesarean delivery for this indication might be reduced to 50%, saving more than 60,000 major surgeries a year, or 8% of the total cesarean deliveries performed. This savings would be moot if there were a corresponding increase in perinatal morbidity and mortality associated with this practice shift. The available data on selective trials of labor support such an approach and suggest that the additional fetal risk is minimal and justified by the reduction in maternal morbidity and mortality. Some of the factors for consideration in determining the risks for an individual patient already have been mentioned. Given the size and shape of the low birth weight breech fetus, most authors agree that fetuses who are breech and require delivery between 1000 and 2000 g are best served by cesarean delivery. The group of preterm fetuses weighing less than 1000 g and in need of delivery require individual assessment. The trauma to be avoided at vaginal delivery may occur at cesarean delivery. The need for vertical uterine incisions, which may require extension into the fundus, makes breech extraction difficult. This is particularly true in the presence of ruptured membranes. Entrapment of the after-coming head is of particular concern in this weight group. As outlined earlier, the head–abdomen ratio and the incidence if “incomplete” types of breech fetuses are predisposing factors. Entrapment occurs at both cesarean delivery and vaginal deliveries with these low birth weight infants. Delivery “en caul” may mitigate against head entrapment at cesarean delivery or vaginal delivery after the delivery of the small fetus. At the other extreme, the macrosomic breech fetus also is an indication for cesarean delivery. Even with a favorable head–abdomen ratio at term, dystocia may be encountered with the delivery of either the fetal abdomen or after-coming head. Prolapse of the umbilical cord is decidedly rare in the first stage of labor. However, with single- and double-footling breech fetuses, the risk increases greatly during the second stage. Therefore, some authors exclude these specific types of breech fetuses from consideration for a trial of labor. For the more common frank and complete types of breech presentation, the risk of cord prolapse is the same or only marginally greater than for a cephalic fetus. It is within this group, who constitute most breech fetuses at term, that a selective trial of labor will have the greatest benefit36 (Table 12). 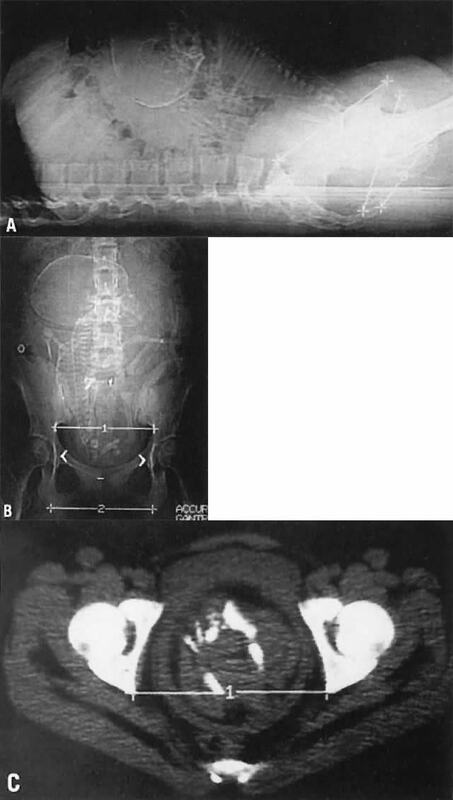 Measurement of the bony pelvis is performed to exclude borderline pelvic diameters. I advocate the use of radiologic measurement of the maternal bony pelvis. Computed tomography scan reliably measures pelvic dimensions and the attitude of the fetal head. Magnetic resonance imaging also has been successfully used in this setting.37 The outcome of term breech delivery may be facilitated by only allowing a trial in women with pelvic measurements shown to be associated with successful breech delivery.38 Todd and Steer,6 in reviewing more than 1000 breech deliveries at term, demonstrated a critical difference in perinatal outcome when the pelvic inlet measured greater than 12 cm at the transverse of the inlet, and greater than 11 cm for the AP diameter. Gimovsky and associates38 expanded this to include a midpelvic diameter of greater than 10 cm (Table 13). Several authors have demonstrated the efficacy of this measure.39 The use of computed tomography scanning results in a limited exposure of the fetus to ionizing radiation.40 An additional benefit is the reproducibility and ease with which pelvic measurements may be obtained. Typically, three views are obtained (Fig. 6). Because most patients will have undergone a failed attempt at ECV, I obtain pelvimetry at that time for the patient selected for a trial of labor. Patients in whom we are unable to convert a breech presentation are unlikely to undergo spontaneous conversion. Alternatively, pelvimetry may be obtained on presentation in early labor. Fig. 6. Computed tomography pelvimetric study. A. Lateral digital scout view for measurement of the anteroposterior diameters of the inlet and midpelvis. B. Anteroposterior digital scout view for measurement of the transverse diameter of the inlet and the interspinous diameter. C. Axial section through the femoral foveae. This measurement tends to overestimate the interspinous diameter. When a trial of labor is undertaken with a breech-presenting fetus, it is crucial for an expedited cesarean delivery to be continuously available. The usual indicators of fetal well-being, as well as the adequacy of the progression of labor, will give rise to the indication for cesarean delivery on occasion. The criteria clinically used in supervising the labor of a cephalic fetus should be applied to the selected term breech fetus. In my experience, as well as others, cervical ripening, oxytocin induction, and partographic analysis of labor are safe and efficacious. Augmentation, when indicated, should call for a thoughtful re-evaluation of all aspects of the situation. For example, is the fetal size less than 4000 g? Has descent occurred progressively during the second stage? Have adequate maternal expulsive efforts failed to effect “crowning?” Oxytocin augmentation should be used only after an internal pressure transducer indicates inadequate contractions. Cesarean delivery should be used liberally in all other circumstances. Anesthesia considerations dictate the usefulness of regional anesthesia, as opposed to earlier approaches that used a combination of local and general techniques. As shown by Crawford,42 regional anesthesia prevents premature maternal expulsive efforts, which should enhance the safety of delivery (Table 14). The second stage of labor should be managed under double-setup conditions. A gowned and gloved assistant, as well as anesthesia and pediatrics personnel, should be present. The patient should be instructed and encouraged to push effectively. The fetal heart rate should be continuously monitored. A nullipara should be allowed to push for up to 2 hours, a multipara up to 1 hour. If delivery is not imminent, cesarean delivery should be performed, the diagnosis being a failure of descent. After lateral flexion of the trunk, the anterior hip is forced against and underneath the symphysis. Expulsion follows, with delivery of the anterior and then the posterior buttock. During “crowning,” an episiotomy should be performed to facilitate delivery. Using a modified Bracht maneuver, a warm wet towel is placed around the fetal abdomen, and the fetus is grasped on the posterior aspect of the fetal pelvic girdle with care to avoid the fetal kidneys and adrenal. A gentle downward traction is exerted. After the buttocks are fully expulsed, the back is born by rotation anteriorly. This allows the shoulders to enter the pelvis in the transverse diameter of the pelvic inlet. If there is a failure of anterior rotation, the fetus will be born as a posterior breech, and the sequence of maneuvers used to help in delivery will differ as appropriate. As the anterior shoulder is seen at the introitus, the operator sweeps the right humerus across the infant's chest. Gentle rotation allows for the posterior shoulder and humerus to be born, completing the Løvset maneuver (Fig. 7). Delivery of the after-coming head follows with manual aid or forceps. A Mauriceau–Smellie–Viet maneuver follows (Fig. 8). The fetus is placed abdomen down on the operator's right arm. The left hand supports the fetal neck. The index and middle fingers of the right hand are placed on the fetal maxilla to help maintain flexion of the head. The assistant may apply suprapubic pressure to expel the after-coming head (Naujok maneuver; Fig. 9). When delivery is further complicated by rotation of the fetal back posteriorly, a Prague maneuver allows for delivery of the occiput posterior breech variant. Forceps may be used to facilitate delivery of the after-coming head (Fig. 10). Maintenance of head flexion is crucial. Traction is not required. The Piper forceps are specially designed for this task45 and act as a class 1 lever. Because the fetal head is visible and should be aligned as in an occiput anterior position, any outlet forceps that may be applied as a simple pelvic application are indicated. Elliott forceps are particularly useful in this situation. Use of forceps may be helpful in a nulligravida or when the fetus is small and at term (less than 2500 g). The infant then should be handed to the pediatrician in attendance. A segment of umbilical cord for acid–base analysis should be routinely obtained. Attention then can be directed to completion of the third stage of labor, as well as the repair of the episiotomy and genital tract lacerations. A full dictated operative note should be completed at the time of delivery. The entire process of the labor, delivery, and immediate neonatal outcome should be referenced. Mention of each specific step is warranted, along with clinical observations regarding the relative ease or difficulty of the delivery process. Most breech-presenting fetuses will be born by cesarean delivery. Attention to the details of delivery are of no less consequence in this group. When cesarean delivery is selected, the fetus should be evaluated before surgery using bedside ultrasound examination. A careful review of the fetus to diagnose extension of the head, the presence or absence of nuchal arms, and the location of the placenta should be made. Although estimates of fetal weight may be less accurate for breech-presenting fetuses, an estimated fetal weight should be made using a standardized formula.46 Amniotic fluid volume and location of the umbilical cord also should be observed. These observations may be important in understanding neonatal concerns after cesarean delivery. They allow both physician and patient to estimate the fetal condition just before birth. Important observations that have been confirmed before delivery include the presence of abnormal postures, broken bones, and the occasional transverse lie (or even an undiagnosed second twin). Cesarean delivery should be expedited if the patient is in labor. Short-term tocolysis has been used so that the most appropriate anesthesia can be administered. Emergency cesarean delivery, with the greater risks of morbidity for both mother and child, should be chosen as a last resort. The abdomen generally is opened with a transverse-type incision. Surgical choice of incision may vary by maternal habitus, prior surgery, or operator preference. Any incision may be used, as long as adequate visualization occurs and mobilization of the fetus is expedited. Palpation of the uterus before the uterine incision should confirm the presentation. A low cervical transverse incision should be made carefully in the midline and extended to a depth necessary to expose the membranes. This is easier to do in practice if the membranes are intact. The important point is that the fetus may be incidentally incised if care is not taken. The infant born by cesarean delivery should be carefully examined after birth in this regard. The fetus should be rotated (if necessary) so that the back is anterior before delivery. The assistant applies fundal pressure as the operator guides the buttocks up through the uterine incision. The use of force on the fundus allows the after-coming head of the breech fetus to remain in a flexed attitude. This approach also should minimize the loss of flexion of the fetal arms, which may result in a nuchal displacement. A warm, wet towel is wrapped around the fetal abdomen to protect the fetus from traumatic injury and to mitigate against the onset of breathing movements before delivery. Thus, by the use of an assistant giving fundal pressure, delivery of a breech fetus at cesarean delivery mirrors an assisted vaginal breech delivery. Avoid total breech extraction at cesarean delivery: it is inherently more of a risk to the fetus than an assisted or spontaneous breech delivery. As with vaginal delivery, a section of umbilical cord should be sent for acid–base status. Attention is given to the description of the delivery process within the operative report. The most important factor in neonatal outcome for all infants is gestational age. This also is true for breech infants. Many series, generally retrospective, some aided by meta-analysis, have studied the effect of mode of delivery on both immediate and long-term outcome. In the absence of congenital anomalies, laboring fetuses born ultimately by cesarean or vaginal delivery have similar outcomes, which are determined by gestational age and weight. Prolapse of the umbilical cord that occurs before hospitalization or goes unrecognized, although uncommon at term, plays a serious and compromising role for preterm infants. Such also is the case for prolapse of the fetal body through an incompletely dilated cervix. Entrapment of the after-coming head may have serious adverse consequences for the infant who likewise is preterm. This may occur at either cesarean or vaginal delivery. Regardless of the rate of cesarean delivery, breech infants have an increased risk of perinatal and neonatal morbidity and mortality. Cesarean delivery plays a role in decreasing but not eliminating this problem. Breech-presenting infants have higher rates of neurologic sequelae than their cephalic peers. The route of delivery plays little role in this difference.48. The issues encountered in attempting to reach the optimal outcome for every pregnancy complicated by breech presentation include psychological, sociologic, and societal values. A strictly medical paradigm cannot perfectly fit each individual situation. Thus, a variety of approaches conform to the standard of care for medical practice. Resident training in breech delivery should include both the approach to delivery at cesarean section as well as vaginal delivery.53 All parties involved must understand the risks and benefits of any suggested approaches. Because economic concerns have been emphasized more, a shift of decision making from the individual patient–physician pair to the consideration of the entire population has occurred. Both strategies must be made consistent. Reitberg C: Term breech delivery in The Netherlands 2006-Doctoral thesis, Utrecht University, The Netherlands, 2007. Hannah M, Hannah W, Hewson S et al:Planned cesarean section versus planned vaginal delivery for breech presentation at term. Lancet 2000; 356:13751383. Whyte H, Hannah ME, Saigal S et al: Outcomes of children at 2 years of age after planned cesarean birth versus planned vaginal birth for breech presentation at term: The International randomized Term breech Trial. Am J Obstet Gynecol 2004;191:864-871. Glezerman M: Five years to the term breech trial: the rise and fall of a randomized controlled trial. Am J Obstet Gynecol 2006;194:20-25. Goffinet F(1), Carayol M, Foidart JM, Alexander S, Uzan S, Subtil D, Bréart G; PREMODA Study Group. Am J Obstet Gynecol. 2006 Apr;194(4):1002-11. ACOG Committee Opinion No. 340. Mode of term singleton breech delivery. Obstet Gynecol. 2006 Jul;108(1):235-7. Gimovsky ML, Rosa E, Bronshtein E: Update on breech management. Contemp OBGYN 2007;52(9):66-73.